Mathematicians, physicists, punsters and even construction workers may pause in their labours on March 14 to celebrate Pi Day in honour of a quirky little number whose significance is felt from the job site to particle physics. "You need pi for anything to do with circles," said Raj Srinivasan, head of the Department of Mathematics and Statistics. "It also has a big role in trigonometry, angles and those sorts of things, and of course it definitely comes into geometry." 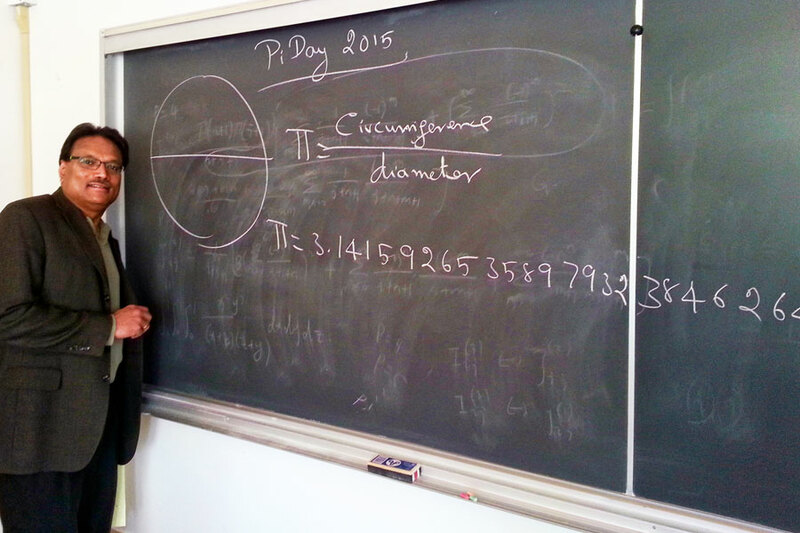 Srinivasan said this year's date is the ultimate Pi Day, which is celebrated on 3.14, the 14th day of the third month. But since this year is 2015, the date can be expressed as 3.14.15. Then add in the time—precisely 53 seconds after 9:26 am is 3.14.15.9.26.53, the first 10 digits of pi. It is a once-in-a-century event. Srinivasan said that at one time, he was able to leverage the day with the local Bay store to get free promotional pi-themed mugs, t-shirts and even samples of Givenchy's "π—the sign of intelligence" cologne. These would be given out around the department. The concept of pi is simple: measure the distance around a circle to get its circumference. Measure the distance across the circle to get its diameter. Divide the first number by the second, and that is pi. Srinivasan explained that pi has been known since at least the ancient civilizations of Babylonia and Egypt. For centuries, it was approximated as somewhere between 3.12 and 3.16. It was not until the 14th century that mathematicians discovered more precise ways to determine the value of pi, which is actually closer to 3.14. Workers laying a circular patio will use pi to calculate how many bricks they need, or how much concrete to use for a cylindrical piling under the foundation of a building. It is also used to explore the foundations of the universe. "Pi shows up all the time in physics, and in my area of theoretical particle physics there are factors of pi in almost every calculation," said Tom Steele, head of the Department of Physics and Engineering Physics. Steele said he and his colleagues "usually talk up Pi Day at the very least," decorate office doors, or engage in a little informal competition to see who can remember the most digits of pi. And physicists have a mnemonic to get them through the first 15 digits (3.14159265358979). He explained: "The number of letters in each word represents the digit. Here it is: ‘How I want a drink, alcoholic of course, after the heavy lectures involving quantum mechanics.'" Pi's name also lends it to puns. For instance, π r2—the formula for calculating the area of a circle—is pronounced "pie are squared," to which the punster responds, "pie are not square, they are round."